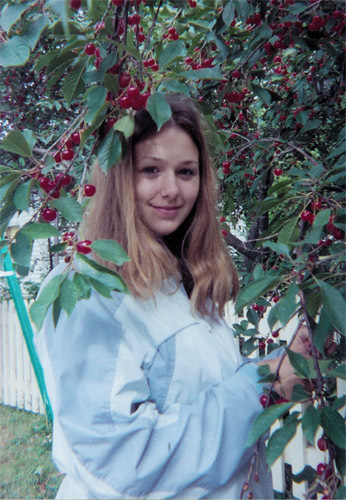 "You mean you want me to pick all of these cherries?" Click to enlarge. 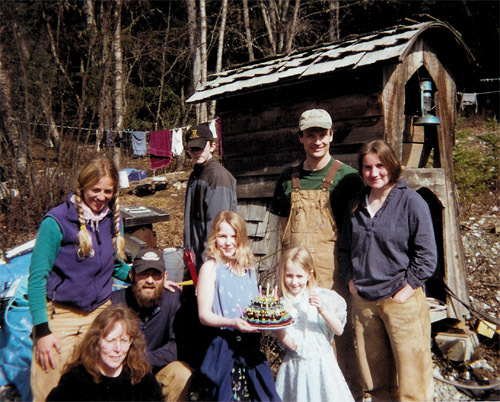 © 2004, Birch Boy Products Jennie's birthday during the 2004 birch season. Click to enlarge. 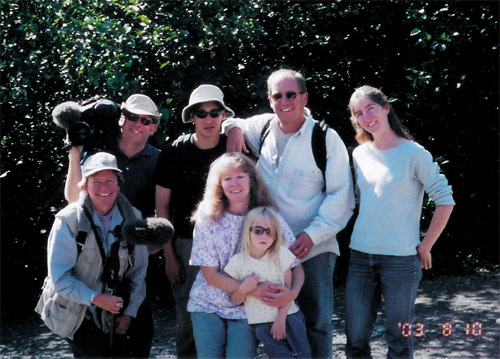 Susan and Jennie Humphrey and Friend, Irene, pose with the Homerun Entertainment's Food Finds production crew during the filming of the "Alaska" episode on the Food Network. Click to enlarge. © 2004, Birch Boy Products Some of our attractive bottles at a recent show. Click to enlarge. 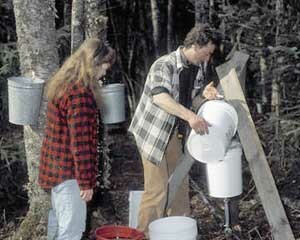 Susie and Mitch collecting sap. 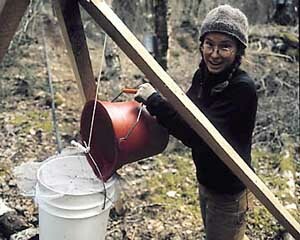 The sap drips from the trees into buckets, which are emptied into the carrying pails. These pails are then dumped into the collection stations. 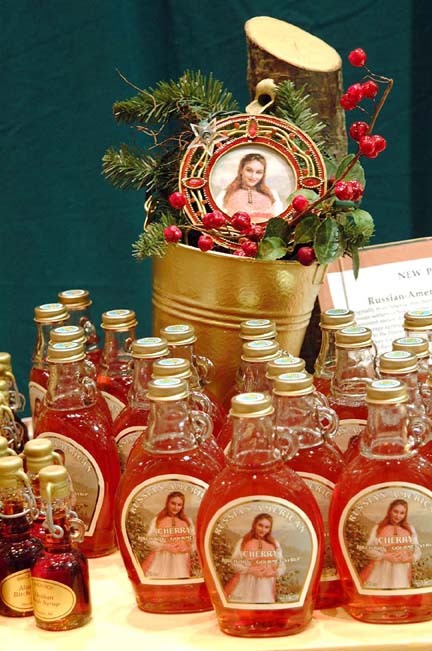 We gather about 16,000 gallons of this sap per season. Evan Humphrey enjoying a sapsicle one early morning about three years ago. The sap has flowed overnight even though the air temperature was below freezing. 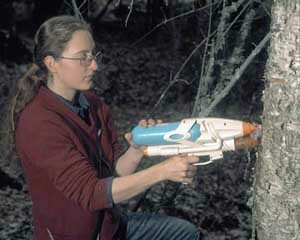 Lisa pouring sap into the collection stations. Sap flows from here into the vacuum line leading to the sugar shack. 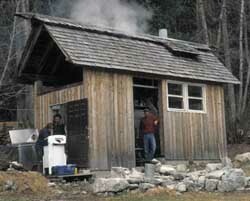 The Sugar Shack. Water is being evaporated from the sap at about 150 gallons per hour. More than a third of this water is captured as distilled water, used for cleaning equipment, making herbal teas, and filling up the hot tub. Daniel and Mitch are monitoring the collecting and processing equipment while Rebecca washes filters in the wringer washer using some of the hot birch water. 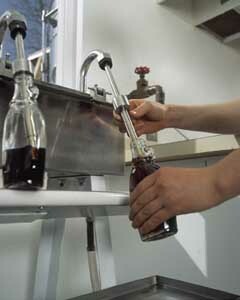 Rebecca bottling syrup with the siphon filler. Meadow flushing tap holes with sterile water. She does this when the taphole is first drilled to remove wood chips, and again later when the tap is pulled to clean the hole before it is corked. Rebecca stalking the hard-to-find buckets. 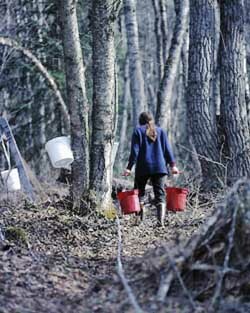 Each sap collector walks about 5 miles in one collecting session, carrying full buckets on half the distance. 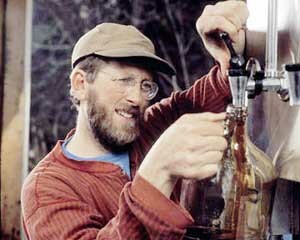 Danny (Prof. Birch) drawing off finished Alaskan Birch Syrup from the warming tank he made from a cafeteria coffee maker. 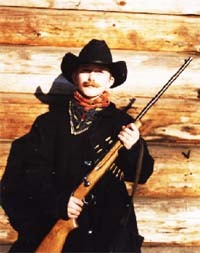 10-year-old Evan dressed up for a wanted poster project (advertising) in front of the tool shed/bunkhouse where sap collectors stay during the sap season. 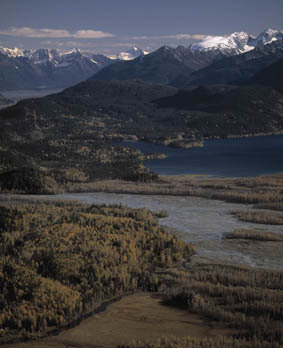 © 2001, CRF Images Buddy (Charles Ferguson) took this aerial photo of Chilkat Lake a few miles south of our home and birch stand. A professional photographer and pilot, Buddy specializes in aerial photography but also produces our high-quality product photos and scans we use in our advertizing and this website. He took many of the photos above during one of his visits during sap season. Check out his website www.crfimages.com.